Today time to talk about another sound machine for the babes, this time the model that tops my personal parenting product list. 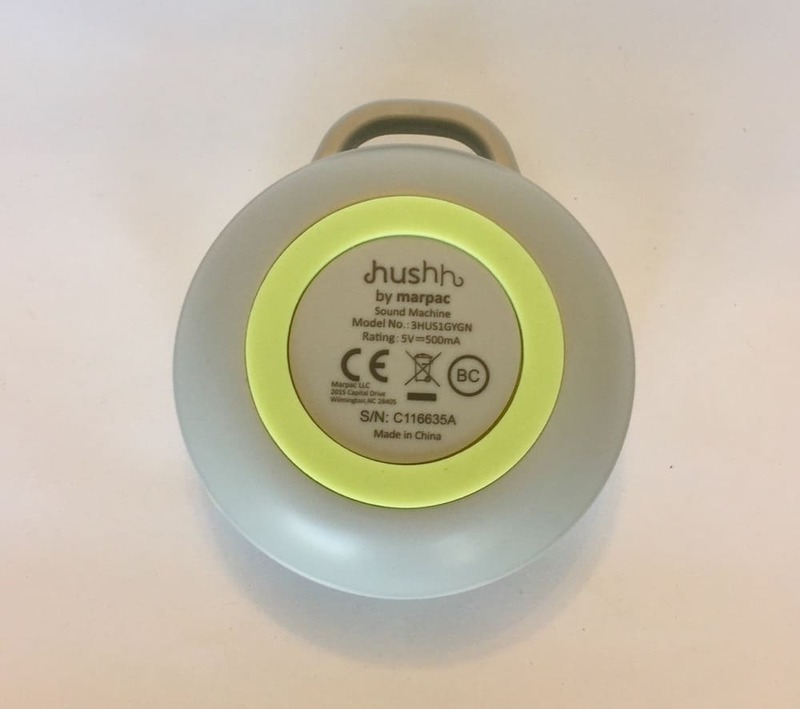 The Hussh Portable White Noise Sound Machine is small, sleek, easily portable and appeals to newborns and adults alike! 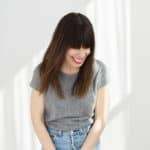 Read on to hear why I am consider this white noise machine a favorite. 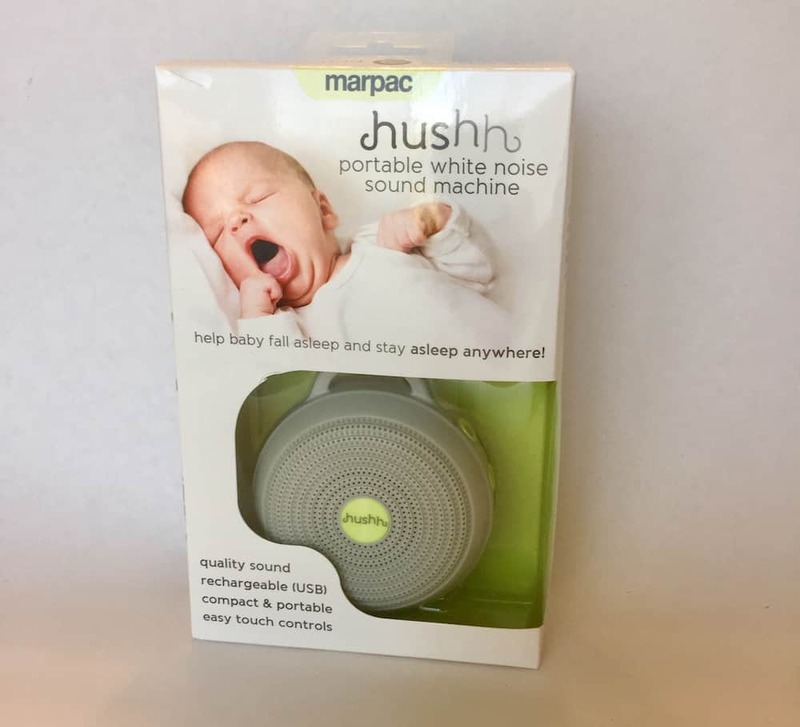 Built with fussy babies in mind, the Hussh sound machine from Marpac is great for new parents. The Hushh Portable White Noise Sound Machine is a highly sought after portable model that tops many parenting “must have” lists. 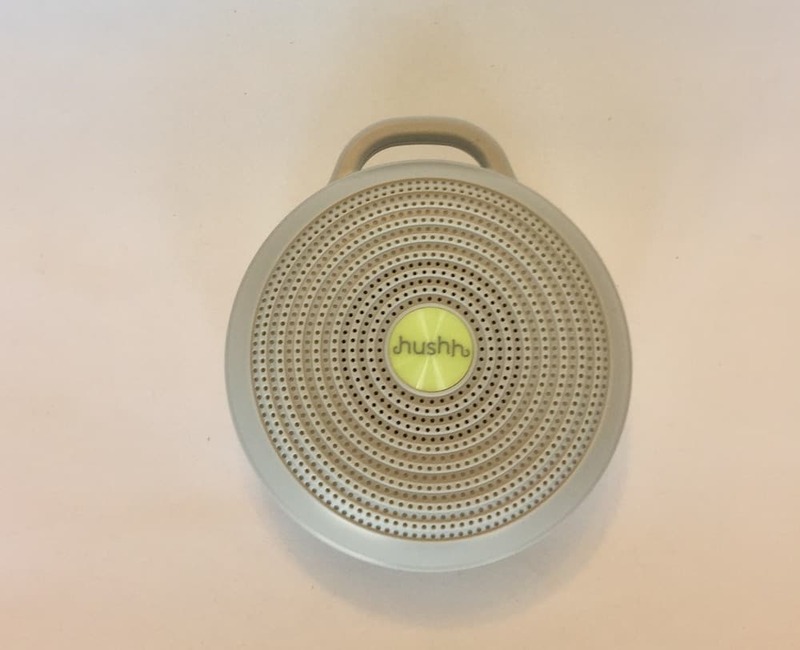 A small, circular sound machine, the Hushh model includes 3 sound options, a rechargeable USB (it’s battery free! ), a flexible clip, amber LED nightlight and a control lock feature. Small in size and mighty in sound, this portable sound machine could be easily stored most anywhere and can charge on the go. In fact, I simply used my computer to test – a huge benefit to the alternative of needing to have extra batteries at the ready, especially when you are a new parent. It has the added bonus of good design, it looks like a mini speaker, which I much prefer to a toy or luvie. The lock feature is smart and will definitely come in handy as the child grows. It allows you to lock in setting features like noise selection and volume, while preventing little hands from changing said settings – key when children are sharing a room when traveling , or at home. Bright white noise: akin to the white noise of an airplane. Deep white noise: similar to the white noise from a fan. Gentle surf: relaxing ocean waves. Simple to use, push the power button located on the side of the sound machine. After holding it for down for a few seconds, as instructed, it will turn on. To change the sounds, push the “S” button once and the machine will move to the next option. To use the LED amber light on the back of the sound machine, press the power button twice to turn on and twice to turn off. Finally, lock in the sound choice and volume, hold down the “S” button, to unlock do the same. In my opinion, there are two prominent perks of the Hushh Works Portable White Noise Sound Machine: the first is the design, the second is the USB charger. Important note worth mentioning – even my husband commented on how he liked the “style and shape” of this sound machine. Perhaps it is because I have two young children, but I am not a fan of anything that has to be battery powered. The addition of another “part” or pieces is enough to deter me from a purchase, so I was instantly a fan of this USB powered option. It is simple to charge and can easily be stored in a diaper bag, purse, or even in your car. As you will find below, many fans of this machine purchased one for themselves for travel purposes. I can see how that would make a lot of sense. The sounds available are smooth, cohesive and can easily lull an infant, toddler or adult to sleep. A popular option among new parents, this sound machine is available at many retails stores and sells for anywhere from $28.99 on Amazon to $34.99 at places like Target, Bed, Bath & Beyond and Toys R Us. This sound machine received very positive reviews. The thing I found most surprising is how many people purchased it for their child and wound up using it for themselves. In many of the reviews I read this machine was coveted by individuals using it as a travel sleep machine for work trips. The negative reviews mostly consist of people unhappy with the amount of time the machine will stay powered after a full charge. I was impressed by and would definitely recommend the Hushh Works Portable White Noise Sound Machine. It is reliable, lightweight, aesthetically pleasing and does not require batteries. 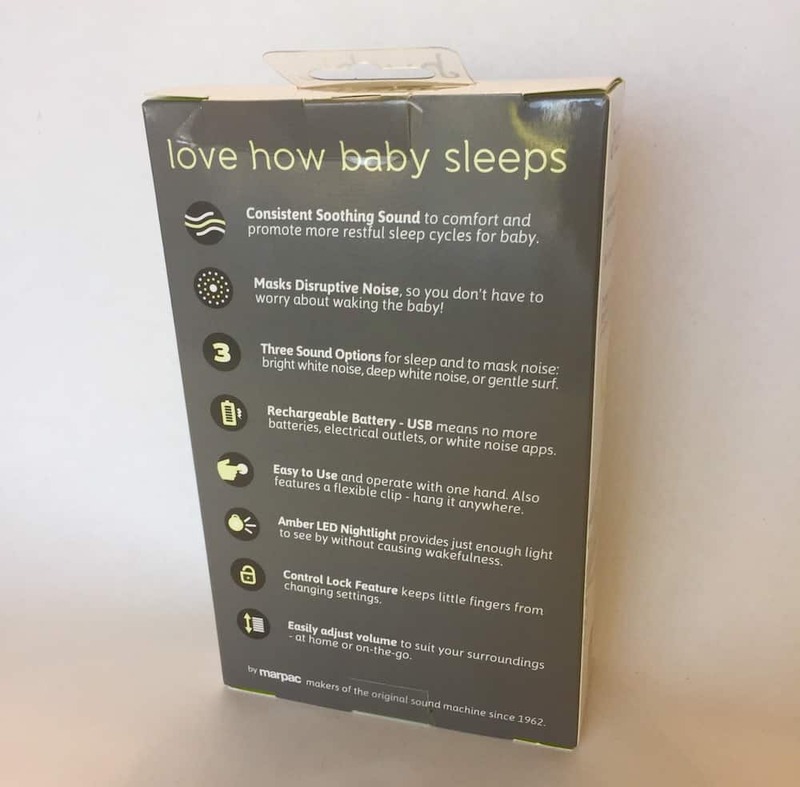 A overall strong option in the portable baby monitor market, this model will easily work as a travel white noise machine well into elementary school (for either the child or the parents). I understand why parents and travelers alike are such fans of the Hushh products!